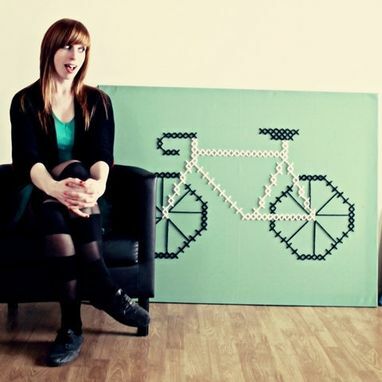 Custom Bike Cross-Stitch wall hanging done with yarn on colored canvas. 50" w by 38" H. Price shown is for unstretched canvas*. Please inquire about additional costs for the canvas to be stretched and shipped. Can be made in custom colors. Products are custom made to order, please allow 2 weeks from order date for cross-stitch to be shipped. Perfect for any bike liker! *Each cross-stitch comes with directions for stretching the canvas yourself, or resources for you to have it professionally stretched. Generally, professional canvas stretching ends up costing less than shipping the stretched cross-stitch.